For spring fragrance, Hyacinths cannot be beaten. Great in a well drained position in the garden, but at their best in large pots full of a single colour. Lovely lavender flowers with a very sweet fragrance. Early spring flowering, 25 cm tall. Pack of 2. Beautiful deep lilac shade. Sure to add an element of cheer to your garden. Very fragrant. Early spring flowering, 25 cm tall. Pack of 2. Deep amethyst blooms, a lovely contrast between the flowers and the foliage. Very fragrant. Early spring flowering, 25 cm tall. Pack of 2. Delightful soft blush-pink shade. Lovely sweet fragrance. Very fragrant. Early spring flowering, 25 cm tall. Pack of 2. Sweet candy-pink blooms, sure to create a calm and relaxing atmosphere in your garden. Very fragrant. Early spring flowering, 25 cm tall. Pack of 2. Soft peach coloured blooms, absolutely stunning. Very fragrant. Early spring flowering, 25 cm tall. Pack of 2. Pale pink-rose blooms that are truly something special. Very fragrant. Early spring flowering, 25 cm tall. Pack of 2. Absolutely beautiful pure white blooms. Assured to be a real standout. Very fragrant. Early spring flowering, 25 cm tall. Pack of 2. Vibrant cerise-red blooms. Sure to be a standout. Very fragrant. Early spring flowering, 25 cm tall. Pack of 2. Dark-burgundy shade, simply elegant. Delightful fragrance. Early spring flowering, 25 cm tall. Pack of 2. Lovely lemon-coloured blooms, the perfect spring hyacinth. Pack of 2. 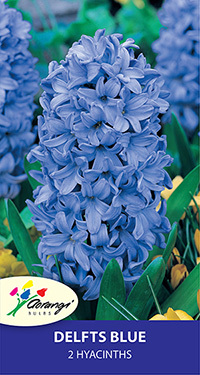 Mixed hyacinths, pack of 5 bulbs. Very fragrant. Early spring flowering. 25 cm tall.